. Your cart will total 93 points that will be converted into a voucher of $93 towards your next purchase! Must be logged in to collect points. 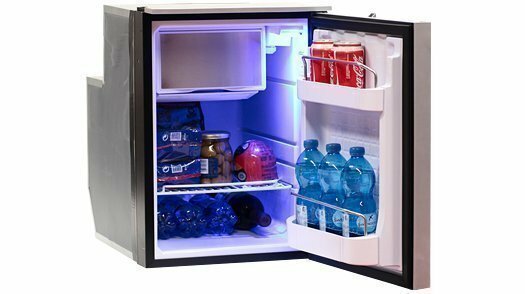 The Isotherm Cruise 49 Elegance Marine Refrigerator is a 1.75 cubic foot boat fridge (49 liters) which is sliver color with a brushed aluminum panel for exceptional durability in the marine environment. The new Elegance design features a two-inch thick door for superior cold retention and operating efficiency. The CR49 Elegance features a four liter freezer compartment, one adjustable shelf with a hatch to allow tall bottles to stand upright and a built-in fan-cooled Danfoss / SeCOP compressor. The CR49 Elegance has an innovative internal mounting system which does not require a mounting flange and interior light as standard. 3-sided silver color mounting frame is optional. The CR49 Elegance is available in the USA with silver door as standard. Optional panels include white, black, and teak. Easy door swing change from right to left. Like all Isotherm fridges, the Cruise 49 Elegance is available in AC/DC or DC-only and covered by the exclusive 5-year limited warranty on the compressor and 2-year warranty on all other parts so you can have the confidence of knowing you’re buying the best. The Cruise Elegance line is the next generation of Isotherm Marine Refrigerators designed to increase efficiency and deliver greater performance in the marine environment. The Elegance line is characterized by a silver door that is two inches thick. This provides greater insulation where it is most critical. The silver color reflects sun heat and brushed aluminum panel has the appearance of stainless steel without the cost. The doors are durable and easy to maintain. The Isotherm Cruise Elegance line refrigerators also have an innovative internal anchoring system which eliminates the need for a mounting flange. Anchoring screws can be secured through the inside wall of the fridge for a clean, modern installation. Optional mounting flange available. Built to operate in the toughest marine environments, use a minimum of battery power, and operate noiselessly, the Cruise 49 Elegance has increased insulation to handle the hottest weather and a new design freezer compartment that delivers optimum performance. It has a Danfoss/SeCOP compressor that offers low power consumption, quiet performance, and operation at a heel up to 30°. 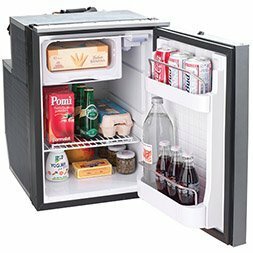 It has a “right sized” freezer compartment that takes up a minimum amount of storage space—allowing for more storage of refrigerated foods and beverages that matter most. It easily holds larger bottles standing upright and has adjustable holders and cradles to keep containers secure in the roughest conditions. Has reversible right hinge.